At Big Bear Adventures we have everything to make your stay packed full of fun and adventure. From miniature golf, ropes course, bumper boats, and so much more. But it is important to get out and see more of where you are staying. Indian River Michigan is a gorgeous place filled with natural beauty and fun attractions. Indian River is located halfway between Lake Michigan and Lake Huron. It's also the center of Michigan's famed Inland Waterway making it a boating and fishing paradise. Indian River is also a hub for some of the finest power sports trails and routes Michigan has to offer. Try canoeing, kayaking, tubing, rafting, and so much more at Big Bear Adventure. We supply the equipment so you can have fun exploring the Sturgeon River. Michigan's largest biking and hiking trail system runs right through town with several cross-country ski trails minutes away. For the convenience of bicycle enthusiasts to our area, Big Bear Adventure now offer shuttle services for the hundreds of people who ride the North Central State Trail each year! We offer customized services and pick-up/drop-off locations based on the Customer’s individualized needs! Bring a camera for all the sights and attractions. The Mackinac Bridge, Colonial Michilimackinac, the Soo Locks, Mackinac Island and many more of Michigan's greatest tourist attractions are a short drive away. Like to watch the wildlife? The Pigeon River Forest offers many opportunities to view the wildlife from whitetail deer to Michigan's largest Elk herd! When fall comes nature's finest colors shine by boat, car, ATV, hike or bike. Whatever you're looking for you will find it here. 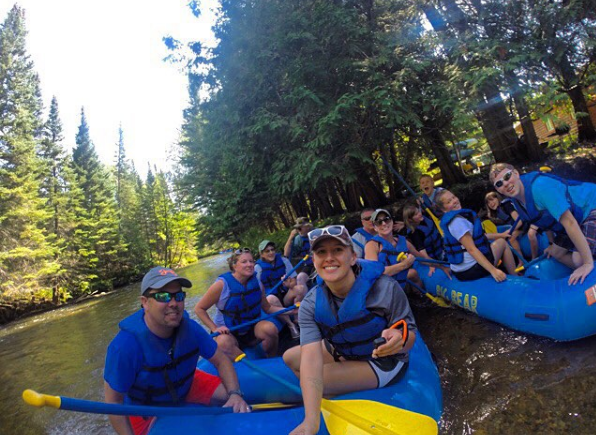 At Big Bear Adventure we want to make sure you have a chance to see Indian River Michigan whether that be you getting out on the town or experiencing it from one of our canoes. After a long day of adventure relax at Northwoods Lodge. The Lodge provides 15 "Northwood’s" themed rooms with log furniture, wildlife décor, and continental breakfast. We also offer a small, 3-bedroom, "dorm-style" facility on-site perfect for groups of up to 12 guests. We make it easy for you to see everything Indian River Michigan has to offer. Book your stay today and start making memories that will last a lifetime.